From Akureyri, our onward journey would take us to Höfn, pronounced hup. So far as I can tell, to get close to the right pronunciation of this little town, you need to say hup as in up while inhaling sharply. Höfn is in the south-east of Iceland and would mark the three-quarters of the way around the island point in our circumnavigation of the island of Iceland. Thankfully weather conditions had calmed down but the roads were still quite treacherous. 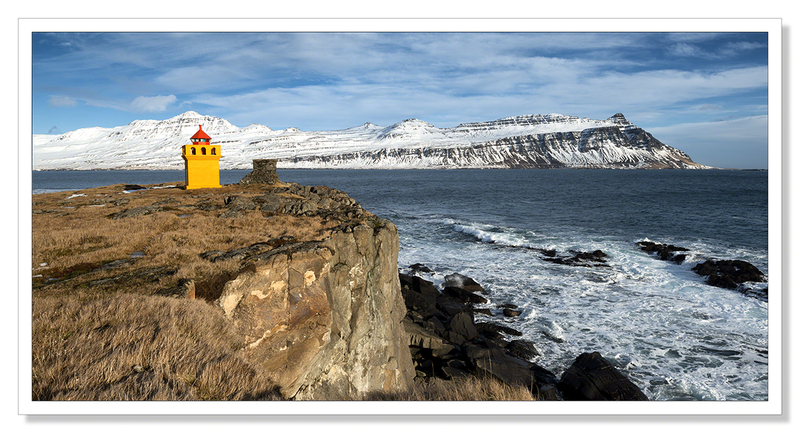 We split the journey in two, opting to stay one night in some apartments right on the coast at Seydisfjordur. Unfortunately, at the last minute, our bookings were cancelled due to some filming going on at the harbour. We were relocated to a hotel at Egilsstaðir. Writing an email of complaint in response to the cancellation, I pointed out that one of the reasons for booking an apartment was so that we could cater for ourselves rather than face expensive restaurant bills. I was on a budget. I was rewarded with an email back saying that the hotel room would now include dinner and breakfast. This was a good result and actually quite a nice interlude in our journey around the island. We had a delicious 3 course meal at the hotel and the breakfast the following morning wasn’t bad either. Committing to the journey south meant accepting that I wasn’t going to see Dettifoss. 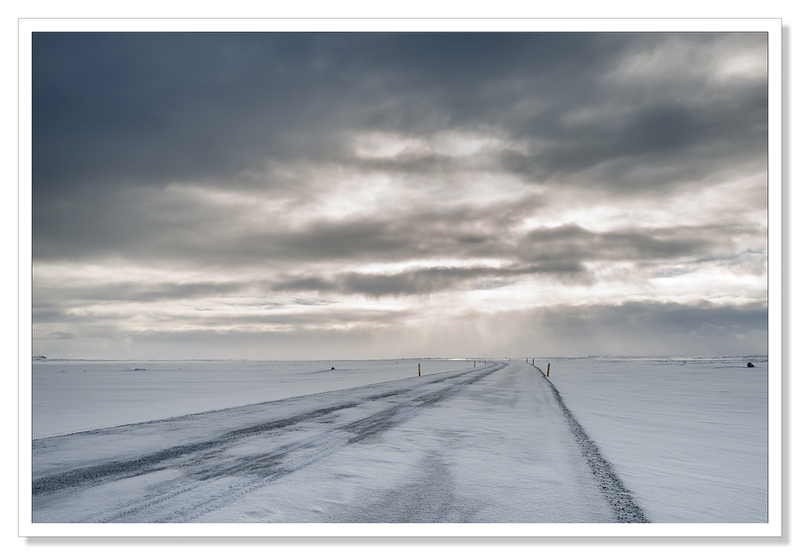 We’d tried to get there a few days before setting off for Höfn. The waterfall is immense. There is more water tumbles over this waterfall than any other in Europe and it’s a pretty magnificent sight. 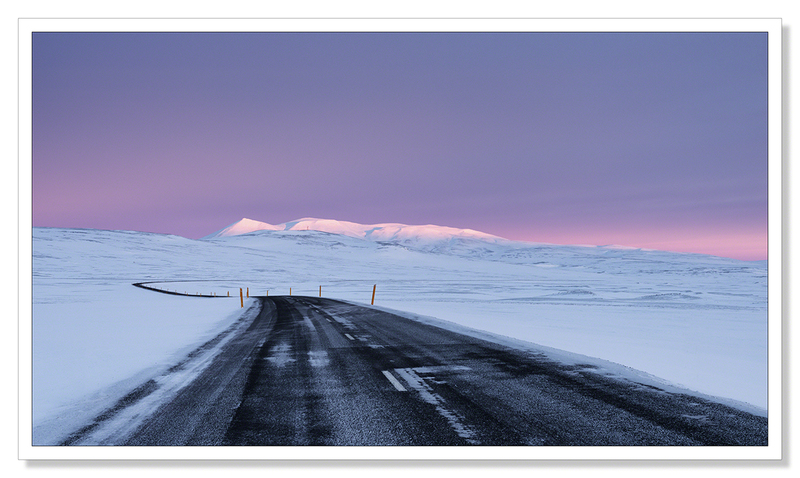 The road to the falls was marked as impassable on the Icelandic Road and Coastal Administration website. We wondered if perhaps the road was impassable along its entire length but perhaps passable as far as the falls. Programming the location into our GPS we’d set of. After about half a mile, we’d come across a couple with suitcases and bags walking towards us. Looking beyond the couple, 2 or 300 hundred yards further back, we could see a VW Golf firmly buried in a snow drift. They’d clearly given up trying to get the car out and were heading back to the main road with all their belongings, abandoning the car. Before setting off on that particular day, I’d seen a shovel outside our apartment for clearing the step and I’d thought that if we were going to tackle an impassable road, a shovel might come in handy. It did, we were able to dig this couple’s Golf out of the hole they’d dug themselves into. They were naturally very grateful, thanking us many times as they packed their belongings back into their car. Free of the snow, they turned around and drove off toward the main road before stopping and turning around again, driving towards us once more. The young lady got out of the car and came running towards us ‘Are you going to Dettifoss?’ she asked. That was still our plan despite this snow drift. We were in a 4×4 Jeep Grand Cherokee, they were in a front wheel drive Golf. No match for the conditions. She clearly thought that perhaps if we made tracks for them to follow, they might make it through. We weren’t sure if we’d make it through ourselves yet and feeling a little guilty, I’d replied that we weren’t sure. They were lining themselves up to get stuck again but having a Jeep in the lead with a shovel, perhaps this wouldn’t matter. We though that perhaps it would. She returned to the car. We could see them having an earnest discussion. The man shaking his head, the woman appearing to plead. He clearly made a convincing and sensible argument and after a few minutes they set off again, back toward to main road. The drift the Golf had been buried in was deep but we made it though and pressed on. We drove through drift after drift but each time we hit a drift, we could see clear road the other side of the deep snow. After a while though, we came a section of the road where the snow was considerably deeper, getting on for two and three feet, as far as we could see. No patches of road surface visible anywhere. Once you hit snow that is deeper than the clearance of your chassis, you start to ask rather a lot of your vehicle. We were able to plough through short sections of deeper snow by keeping up momentum but we figured we were going to be asking a lot of the Jeep to tackle what lay ahead. With snow showers clearly visible all around us. We admitted defeat and turned around. We’d done well. It was just a km or so to the falls. If not for my MS we would have hiked to the falls for sure. It was very disappointing but to a certain extent, this was the price we paid for travelling to Iceland in winter. We’d turned back several times prior to this. We’d had doubts, turned around, driven a while only to overcome those doubts and to turn around only to drive on for a while before fresh doubts set it. Anyone observing might have found our antics rather comical. We might have been braver but back at the main road, there was a sign saying that there was no 122 service on this road. No mobile phone signal, no tracking service. If we’d got stuck, I wouldn’t have been able to walk out and we wouldn’t have been able to phone for help. We made the right decision to visit Dettifoss another time. Here’s a short clip of our drive back to the main road. 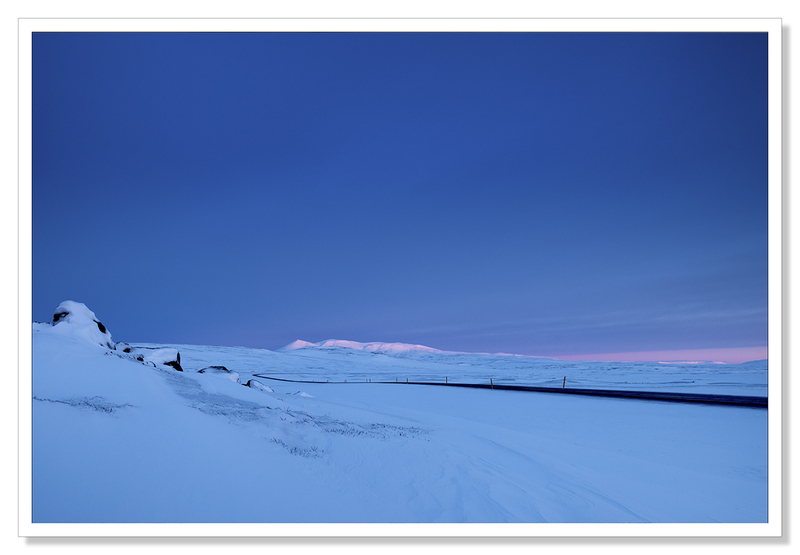 A couple of the more minor drifts of snow we encountered along the way..
Below are some pictures I took on our drive to Höfn. 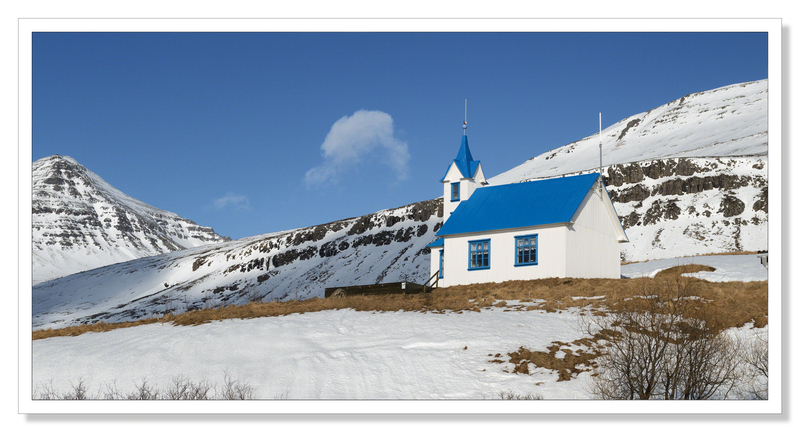 When I saw the blue barn below followed shortly after by a blue church, I wondered if the farmer, and those in charge of the maintenance of the little church had taken advantage of the same deal on paint at Iceland’s equivalent of B&Q or Home Depot. A good colour choice all round I’d say. 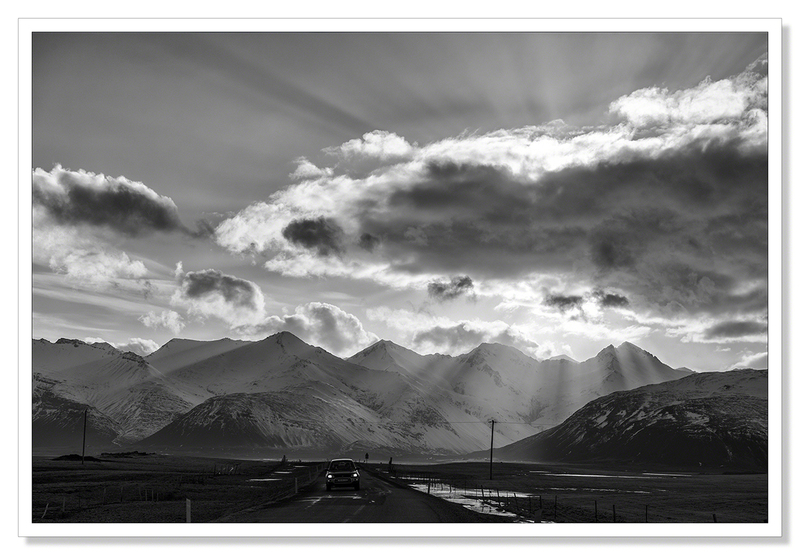 When I took this final picture, it was one of only a very few occasions when standing in the middle of the main road the runs around Iceland taking photos, that a car actually came along. I was quite glad when this one did. I definitely think the car, with headlights blazing, adds to the image. I hope you enjoy the images. This entry was posted on March 31, 2015 by Chillbrook. It was filed under Photography, Photography and Travel and was tagged with Adrian Theze, Black and White photography, Cornwall Photographic, Iceland, Iceland in winter, Icelandic Barn, Icelandic Church, Icelandic Lighthouse, Landscape Photography, Lighthouse, Photography, Waves. Beautiful, clear, clean skies!! Takes me back! Very nice! Spectacular views all the way around. And thank you for the pronunciation lesson. I will remember this one! I have been trying to learn some Mandarin so I am used to curious pronunciations!! But I still like the language, the syntax is different and easier than English! That’s quite a challenge. I learnt Japanese as a post-grad but to do that I was shut in a room for 6 month, 6 hours a day with a Japanese lady who spoke no English. It worked but it was hard work. I’ve been at it for 3 years on my own. I can make very simple small talk and that’s about it. Once the kids get out of high school I may have the time to get more intense – still four years away from that target! That takes some doing! You have to be very dedicated to study like that! Great tale – and fabulous photographs as usual! The colours are certainly eye-catching but my personal favourite is your last mono shot; the light and depth of image are lovely and, as you say, the headlights add that little something extra. Thank you Noeline. I was very pleased with the last shot. It was one of those instances where the choice to convert was an easy one. The black and white version had just that little bit more drama I think. A beautiful serie, well done! Thank you very much Hans! Aw these are SO how it was ChillB ! How on earth did Poppy miss that little blue Church ;-) The waves all round the coast were breathtaking in more ways than one …. The midnight sun was wonderful. We were in Sauðárkrókur on June 24 so we put our feet in the Arctic Ocean at midnight one night…it was pretty magical. But it also looks good in the winter! I remember Sauðárkrókur well. It was snowing very heavily when I drove through. 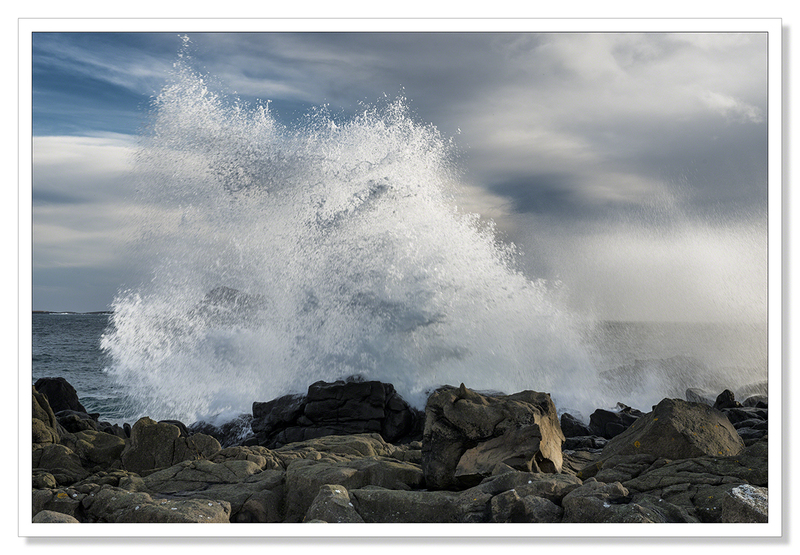 There are some photographs taken just around the coast in an earlier post, The Journey Continues. Wonderful pictures but to cold for me in winter. Brilliant photos! 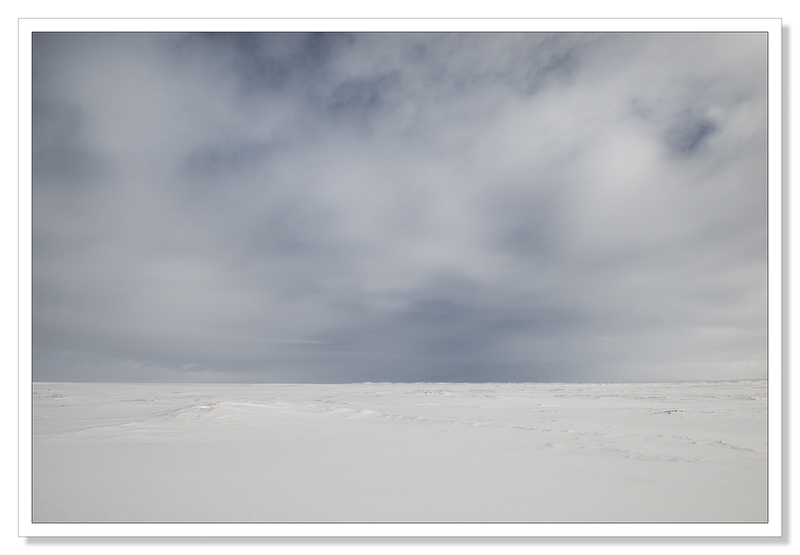 Iceland is so photogenic in the snow, especially with those blues and yellows. Do you agree it is more so than without snow on the ground? This was an unexpected journey with beautiful motives and light. I’m quite happy to learn from your impressions. Thanks for sharing your knowledge. Thank you for the drive video. I’m chilly just watching, but also in awe. Another magical set. 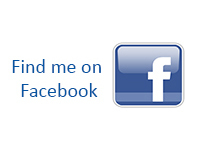 Spectacular photographs and I very much enjoyed your travelogue. Sounds like you made out quite well, dining at the hotel. Any idea what the filming was about? How wonderful that you thought to bring a shovel and were able to assist your fellow travelers! 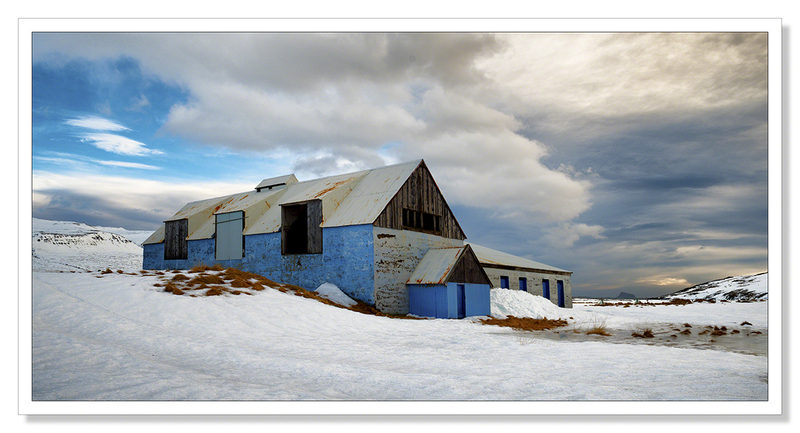 The blue on the barn and the church is lovely in contrast to those metallic earth tones. 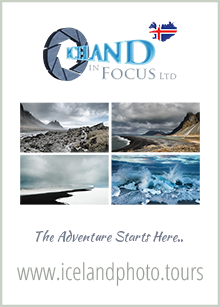 Have you by any chance been in touch with Iceland’s department of tourism? I would think they might show some interest in your photographs. Breathtaking views and photos! Envy you with white enviousness! Thank you Sue. As I said to Elena. The drive was fun in hindsight but we were, literally on the edge of our seats. I’m glad we decided not to push our luck any further than we already had. Love the top two images especially Adrian……fantastic pastel orange/pink highlights on the mountains in the background. Thank you Mark! It was an incredible sunrise that morning. Thank you Andy! It’s funny how the hastily snatched shots so often seem to outshine those where you have all the time in the world to set up and wait for the right moment to press the shutter. The black and white photo here and the ‘bonsai on the rock’ photo in the previous post are two such examples. There’s a lesson there somewhere I’m sure. Shooting from the hip so to speak, reacting quickly to the pictures that present themselves, makes me think some much lighter kit than I have now (the D800e is so heavy, plus I need a tripod as it’s too heavy for me to effectively handhold now) that delivers similarly on quality would be great to have to hand. The Sony A7R looks interesting but the price tag is high..
I’m a firm believer in the subconscious eye – I think it plays an important role in directing our eye. Otto von Munchow ( I think you follow him) refers to that state of ‘subconscious viewing’ as being ‘in flow’. I understand what he means by that now. I keep thinking I need a better quality more compact camera but I can’t get my head around the task of deciding which one. There is just too much choice these days. Bewildering! I think I uderstand what Otto means now too Andy. There is a bewildering array of choice out there and I really think the mirrorless design of the latest cameras seriously challenge the design of the traditional D/SLR. The Sony A7R has the same sensor as the D800e but by dispensing with the clunky mirror mechanism, it’s a fraction of the size and weight. A full frame camera that’s the same size as a compact.. It’s got to be a winner. The only other manufacturer to offer a full frame compact at the moment is Leica but as the Leica M is getting on for £5000, it’s definitely outside my price range. I have no doubt that other manufacturers are going to be following this trend though. Your adventure gets more and more dramatic. I can understanding your disappointment of not being able to see and photograph Dettifoss, but like you pointed out, it was probably the right decision to turn around. You still got some amazing photos from this part of the trip. My favourite is no doubt the first one, with the beautiful blue light with a touch of pink in the mountains at the far end. These are just an incredible series of photos Adrian…each one had me exclaiming it was my favorite. The first two perhaps caught me the most, with the minimalist eye (and the incredible streak of lighting) making the first one I’d love to hang in my office. Beautiful. Thank you very much Randall. Coming from you with all your beautiful photographs at your disposal, that’s quite a compliment. Much appreciated. Oh that light! Spectacular images. I love how you write about your journey too, Adrian. It’s been a fascinating one! Thank you very much Karen. I’ve enjoyed writing a little more this time and describing this trip to Iceland a little more. The light was gorgous throughout this trip. I think there was only one day when it was a flat, very dull gray. Thank you. I enjoyed deserted. It was very quiet everywhere but the snow made travel difficult. I think there were plenty of people visiting Reykjavik and joining tours that all seemed to be operating in the golden circle. Your photos are so beautiful, I don’t know what to say. But – yes, that color is striking and it’s great that they used that they used that paint, but the colors you caught in the first tow photos are beyond! I enjoyed riding with you in the video, too. Glad it all worked out with the hotel switch, and what a story about the other couple, the lucky shovel, the good will and the longing. You were smart though! Great adventure story to go along with spectacular photos. Hard to pick a favourite photo but that sunny yellow lighthouse appeals to me greatly. That couple was lucky you came along when you did and that you wisely discouraged them from following! Thank you! It’s a very beautiful part of the world!